If someone had asked me to imagine what 250,000 books looked like, I’m not sure I’d have had a clue. A quarter of a million anything is a lot, that much I do know. But I was always rubbish at guessing the number of smarties in the jar at fêtes, and those numbers were always in the hundreds which is much more manageable somehow. 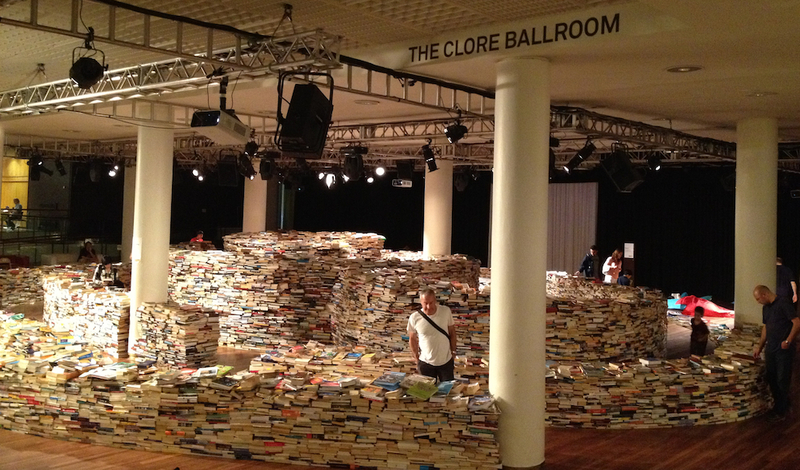 Anyway, in case you happen to be wondering what 250,000 books looks like, there they are, made into a maze resembling the fingerprint of writer and educator Jorge Luis Borges by Brazilian artists Marcos Saboya and Gualter Pupo in the Clore Ballroom at the Royal Festival Hall. As with almost everything else in London this summer, it’s part of the London 2012 Festival, the culmination of the Cultural Olympiad. There’s a slightly obvious pun going on here in that we talk of losing ourselves in a good book and of course the point of a maze is to get lost, but that aside what’s not to like about being surrounded by great walls of books? At their tallest, the piled up books were certainly taller than me – admittedly that’s not that difficult, but by a decent margin I think – with a gradual rise from low walls on which it’s easy to rest the books you want to look through; on one section of the low wall there are some braille books. Some 60% of the books have been loaned by Oxfam with the rest donated by publishing houses, booksellers and the like (all of which will go Oxfam at the end of the show). 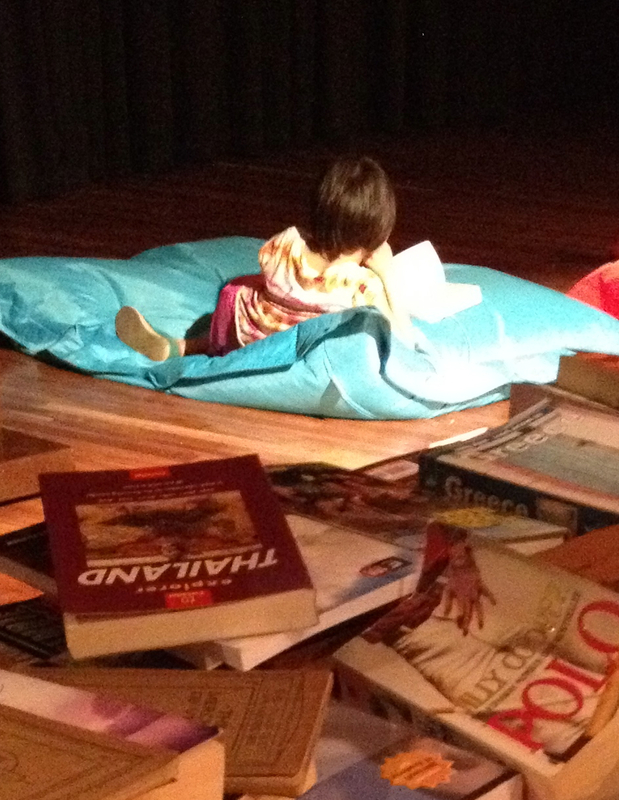 Though visitors are asked not to take books away, looking through the top layer and reading anything that appeals is encouraged and – this being the Festival Hall – there are plenty of sofas around (along with a few bean bags for sprawling purposes). 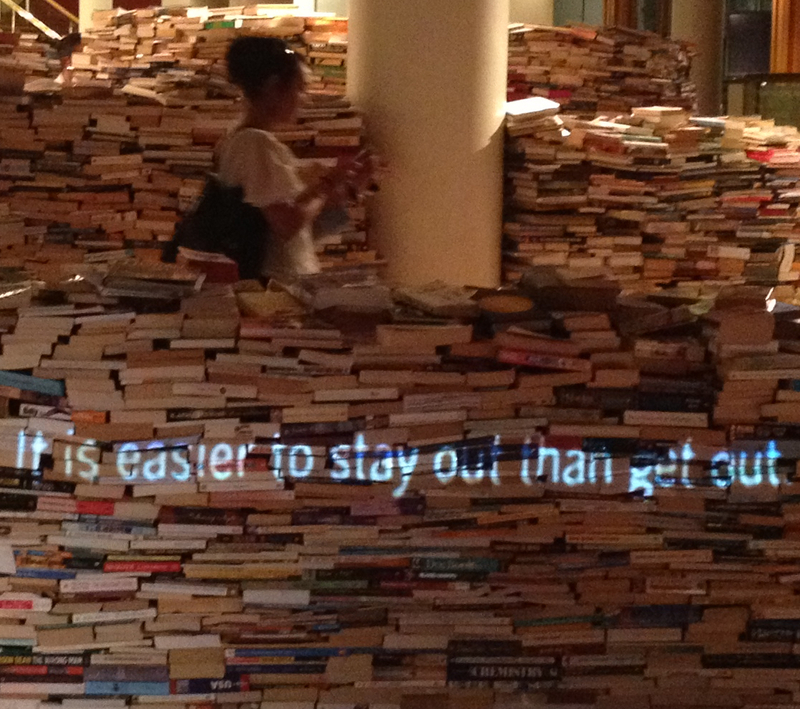 At times quotes are projected onto the maze and a screen beyond it. Though these are from different authors for some reason the two that have stuck in my mind are both Mark Twain: ‘it’s easier to stay out than get out’ and ‘don’t let schooling interfere with your education’, both of which seem particularly apposite. The building of the maze is also projected onto it at times along with other video imagery. I spent quite a while happily browsing the book titles in the walls – like checking out the bookshelves in someone else’s house but way more random – and looking through books that caught my eye (yeah, I admit it, mostly slightly rubbish looking cookbooks and anything that seemed to have been transported straight from the 1970s) and at times dodging fast moving children for whom the non-challenge of getting to the centre had to be attempted at speed it seems. I’m not sure I took anything particularly profound from the piece (no surprise given my choice of browsing matter, I admit) but nonetheless this is art that gets people looking at books and it’d be hard not to like that. And if I learnt nothing else – and I suspect I did as I’m not sure I could have attributed those quotes with any degree of accuracy before – at least I now know what a quarter of a million books looks like. In this age of ebook readers, that’s bound to come in handy sometime. 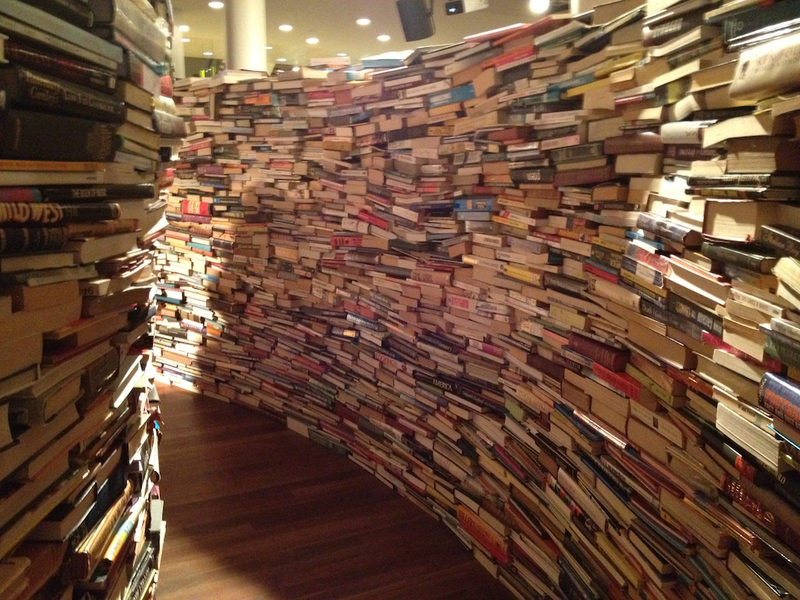 This entry was posted in Assemblage, Installation, Public Art and tagged aMAZEme, art, books, Gualter Pupo, installation, literature, London 2012, Marcos Saboya, Marcos Saboya and Gualter Pupo, Mark Twain, maze, reading, Royal Festival Hall by Ann Jones. Bookmark the permalink.